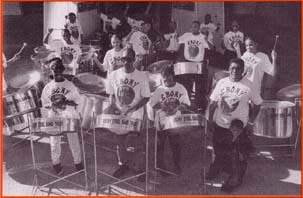 Ebony began in 1968 when a small group of enthusiasts living in London got together to play steel pans and continue the culture of Trinidad and Tobago here in the UK. In 1983 Ebony won the Panorama Championship title and suddenly went international, performing in Sweden and Denmark and increasing performances in England. In 1985, by invitation of the Greek government, they became the first steel band to tour the Greek islands. Over the past 20 or so years Ebony have built on this success. Their list of prestigious performances includes the Royal Opera House, Covent Garden, the Effested Festival in Wales, the opening ceremony at the Special Olympics and the Duke of Edinburgh Award Garden Party at Buckingham Palace. Recent performing highlights include an invitation to Berne in Switzerland to take part in Solid’ Americas – a Concert in Solidarity with Latin America and the Caribbean. Ebony also won the National Steel Band Music Championship in 1993. Ebony Steel Band perform for church ceremonies, parties and social events as well as concert venues, bringing the distinctive sound of steel pans and memories of Trinidad and the Caribbean to the UK.